New: Maze Mutiny is an email based subscription program to a series of maze creators that are so incredibly innovative that they will shatter anybody's preconception of what computer generated mazes should look like. 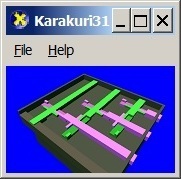 The moment you enter your email, you will receive the main executable containing two mazes. Then you will periodically (our goal is once a month) receive a different graph file that defines the cell structure of the newly invented maze. Currently everything is free. Digitally signed for your protection. Subscribe early to collect all graph files! Teaches electrical engineering students binary counter design. Comes with Wizard, Bubble Diagram editor, Finite State Machine Simulator, State Transition Table, Boolean Expressions Generator, and Circuit Renderer. Buy from Google Play. A variant of the so-called Knight's Tour puzzle. You must visit every tile exactly once using the movement of the Chess Knight. Buy or get it for free from Google Play. Draws random mazes in the shape of pentagons. Draws random mazes in concentric circles. Click here to download freeware. Maze made of walls at arbitrary angles. 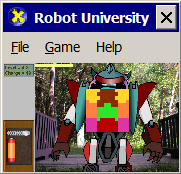 Fit randomly shaped blocks into robot. Requires DirectX 9.0c or higher. Flip, rotate, and join odd-shaped pieces to create a familiar shape. Click picture for detail. Slide levels in a certain order to unlock treasure chest. Requires DirectX 9.0c or higher. Put numbers in order by rotating tiles in groups of four. Flip, rotate, and fit 5 randomly shaped pieces into a square. A sliding-tile puzzle played with triangular tiles. A freeware puzzle of restoring the numbers in the correct sequence. 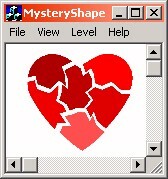 Warning: this program requires VBRUN300.DLL. 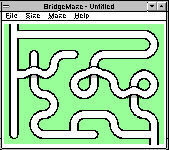 A freeware program that draws mazes with bridges. Draws random mazes in the shape of Hexagons. A 4-variable Karnaugh Map program that displays the prime-implicant solution. Not a game. Click picture for detail. Click here for video. 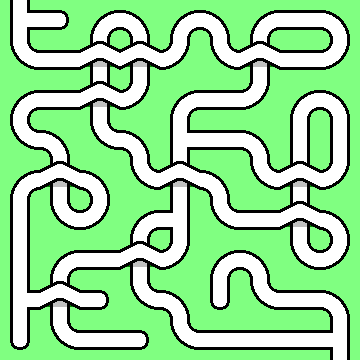 A maze (Labyrinth) without dead ends, constructed of 90 and 45 degree walls. Travel inside the thin parallel lines. Click picture to run. This page lets you create a maze that contains a secret custom message with just your browser. 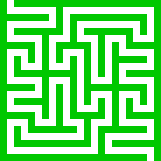 Print the maze on paper and use it for any purpose for free! Click picture to run. 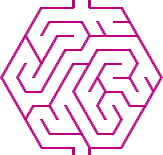 Royalty-free hexagonal mazes you may print out from your web browser. Click picture to run. 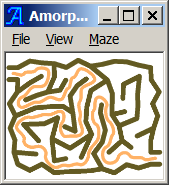 A web-based program that draws mazes with bridges. 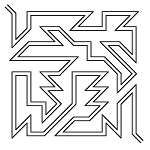 Click on left picture and refresh your browser to make a new maze. 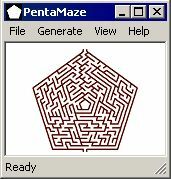 Click picture to run, then hit F5 to generate new maze. Now, you can get 100 mazes in a ready-to-use PDF format!